Frank L. Allen of Newfane entered into rest suddenly, on September 13, 2018. He was born to the late Robert and Dorothy (Nerber) Allen on May 10, 1959. Frank was predeceased by his parents and his brother, John Thomas. He is survived by his brothers, Robert (Meg) Allen of Florida, Donald (Nadine) Allen of Lockport, Roy (Kathryn) Allen of Lockport and a sister Melinda London of Niagara Falls, several nieces, nephews, and friends. Frank loved his family, his friends and being in the outdoors. 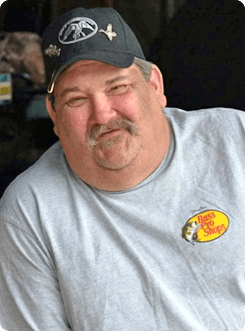 He enjoyed hunting, fishing, music, local sports teams, and NASCAR. Frank loved to laugh and his sense of humor brightened everyone's lives. We will surely miss his laugh, his jokes, and his love for life. Those wishing to honor his life can make a donation in his name, to a charity of their choice and condolences may be offered below.